directia 5 was established in 1991 in Bucharest. The following year, they released the album “La vulturul de mare cu pestele in ghiare” and sang in Bulgaria at the “Golden Orpheus” festival and in October presented two songs at the Bregenz Festival from Austria, where they won the II prize, the contest being transmitted live by MTV. In March 1993, the band released the album “Seductie” and the first single is “Seductie”. In 1994, directia released the album “Pantofi de lac”, produced by a Romanian-Belgian company. The release takes place simultaneously in Romania, Belgium and Luxembourg. directia 5 participated in the International Bucharest Rock Festival (’91 / ’92), and in the International Festival “Cerbul de Aur” Brasov 1994 and is the only group who participated in the final phase of the “Rock L’EST” festival. Same year, at the POP ROCK Festival in Bratislava, Slovakia and at the “Merce in Barcelona” contest. In parallel, they started working with Loredana Groza and released several songs that appeared under the title ‘Loredana and directia 5″.In 1998, after a break of four years discography, directia 5 returns with the single “Altul mai bun”, followed by the album “Superstar” in 1999. “Cantece noi cu directia 5″ is the album released in 2000, album that brings back the band on the music charts. The album includes 11 tracks and a “gift from the group”, the song “Te voi astepta”. The first single from the album is “Daca ai sti”, a rock ballad, which is a representative hit for the band. “Daca ai sti” brings an award at the Mamaia Festival 2000. Other singles from the album are “Poti sa visezi” and “Am nevoie de tine”. Also, directia 5 released the song “Langa mine”, featuring Paula Seling, and “Obsesia”, from the same album – “Cantece noi cu directia 5. In 2001, directia 5 had an amazing concert at the National Theater from Bucharest. The show is named “Obsesia”, and it is celebrating 10 years of activity of the band. In 2001 – the band receives the awards “Best Rock Award”, at the Romanian Music Awards. Same year, another song – “Esti stilul meu”. October 2001 – the album “Octombrie” and a month after the mega-concert at Sala Polivalenta Bucharest, celebrating 10 years of activity. The following months have meant a Romanian tour promoting the new album. February 2002 – takes place a special concert – “Primul meu sarut” / My first kiss, at Sala Palatului Bucharest, in front of more than 4000 people. The band had many special guests, such as Ana-Maria, Nadine, Luminita Anghel, Andra, Raluca (Angels), Andreea Banica, Raluca (Nitro), Giulia ( Candy), Cristina Rus and Delia Matache. 2003 – they released the DVD “Cu nimeni nu te-as inlocui”, the album “Promisiuni” in 2004 and “O zi de primavara,” released in 2005. 2006 – brings 2 different live version for “Satifactie”, one on DVD. If in 2006, they had “Ambiental, in 2007 released “Impresii personal, and in 2008, two new projects: “Ambiental cosmic” and “Aniversare”. New year, new discography. Its the album “Emotie”, released in 2009, and lots of concerts. The amazing album “Declaratie de dragoste” is released in 2010 and proves to be a successful one. The next three years, directia 5 surprised the public with albums such as: “Clasic” (2011), “Electric Love Story (2012) and “Zambestul face minuni” (2013). 2014 – working with Lidia Buble for the single and video “Forever Love”. 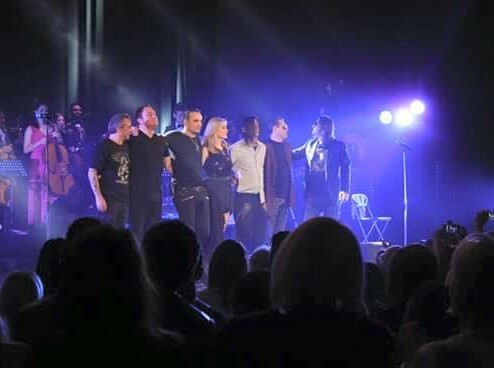 Lidia was their special guests at the amazing concert “Rock’N'Roll, Baby”, held on October 31, 2014 at Sala Palatului. This concert meant a new show concept, an incendiary concert and a new album . In 2015, the band collaborates with a new beautiful woman – Alinka (ex Asia) for the single and video “Te iubesc”, which gives the title of a mega-concert that takes place in the autumn at Sala Palatului,. With each song released, with each concert or TV show, dIRECTIA 5 has consolidated its status as the most appreciated the pop-rock band in Romania. In more than 20 years, dIRECTIA 5 has released over 20 albums and dozens of songs, individually or together with reference names in the Romanian music – Andreea Banica, Loredana Groza, DJ Phantom, Paula Seling and many others.